Gulfport, MS based form offers details on valuations, coverage area, and order form. Gulfport, Mississippi production company specializing in concerts and other special events also providing sales, installation, and rental of sound, lighting, backline, and staging equipment. Agency can assist you in child custody and support disputes, child abduction cases, asset searches, background and employment checks. Serves the Tampa Bay area and central Florida from its Gulfport office. an enterprise agency of the state of mississippi and is governed by the mississippi department of economic and community development and the mississippi state port authority board of port commissioners. it serves as one of the import and export gateways in the southeast. 400+ bed facility located in Gulfport. Overview of services and clinics, news, and patient information. This 1/4 mile, asphalt, dragstrip is located in Gulfport. Classes include King of the Hill, Ford vs. Chevy, Jet Cars, Alcohol Funny Cars and Door Slammers. Includes schedule, photo gallery, weather and links. Located in Gulfport. Contains photo gallery, rates and directions. Offers calendar, image gallery, den pages, and contact information. Breeding black and ASCOB Cockers for the show ring. Located in Gulfport, Mississippi. Offers a calendar, contact list, photographs and information on activities. Bradley Natural Childbirth Classes taught weekly in Gulfport, Mississippi. Providing hospital and physician contact information and descriptions of specialty medical services. Located in Gulfport. RV facility in Gulfport with 100 full service pull through RV sites. Features include 24 hour security, ADA approved showers, LPG, convenience store and internet hookups. Attractions and casinos nearby. The former location of the Grand Casino Gulfport. Includes information on gaming, dining, and accommodations. personal injury attorney based in gulfport. personal injury and criminal defense firm, with offices in gulfport. general practice law firm, with offices located in jackson and gulfport. gulfport firm, providing representation for personal injury and criminal defense. Contains visitor information, ministry descriptions, staff biographies and congregation history. gulfport lawyers focusing on estate planning, family law, general civil and trial practice in all courts. defense attorneys practicing in numerous areas of law, from offices in louisiana and gulfport, mississippi. located in biloxi, gulfport, ocean springs and diberville. provides information about their history, services and current obituaries. Provides worship schedule, event calendar, church history and photos. law firm, with offices in gulfport, and in mobile and montgomery, alabama, offering services for personal injury, malpractice, and pharmaceutical product liability cases. providing a broad range of legal services from offices in jackson, olive branch, and gulfport, mississippi and new orleans, louisiana. includes history, services offered, related information, and current obituaries. locations in biloxi, gulfport, ocean springs and diberville. with offices located in gulfport, jackson, hattiesburg, southhaven, pascagoula and tupelo, provides representation for debt relief, medical malpractice, disability claims and veterans benefits. Worship including service times, Sunday school, music, calendar, preschool, Bible studies, youth and children, staff and map. Gulfport, Bay St Louis, Ocean Springs - Center offers yoga classes, and workshops, massage, Tai Chi, Pilates and corporate stress management seminars. Articles, poses and links to books and videos. defense firm in gulfport focusing on torts, workers compensation and gaming. information request form, attorney biographies, and client list. A full facility post on the Mississippi gulf coast, midway between New Orleans, Louisiana and Mobile, Alabama. Mississippi Gulf Coast covering Gulfport High, Long Beach Middle and Bay High Schools. Events and resources. Gulfport Christian radio station offers a blend of inspirational, light contemporary, and praise music and Bible teaching programs. Features community news, Christian resource links, and local weather. new orleans, biloxi/gulfport, mobile, and other fm radio dials along the gulf coast. SiteBook Gulfport City Portrait of Gulfport in Missisippi. 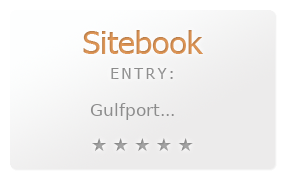 This Topic site Gulfport got a rating of 3 SiteBook.org Points according to the views of this profile site.